There are all sorts of treatments for Vein Disease, and it can be daunting for a patient to be put in the position of selecting the best one. Patients must sort through the different names for the different laser based treatments with many different wavelengths, even though they all have similar outcomes of success and similar side-effect profiles. The alternative to laser – RF, is highly touted on many websites. There is little evidence to support that either is better or worse in terms of outcome, procedure discomfort or side-effects. We will carefully explain all the therapeutic options and answer all your questions so that we can make the best choice for your vein disease together. The latest technology is mechanico-chemical ablation, which we also offer here at North Beach Vascular. This technology does offer some advantages, including less bruising and soreness post-procedure, and a shorter procedure time. We are the first in the area to offer this exciting new option. Conservative treatments are lifestyle changes, such as weight loss and increasing activity levels. Wearing support hose is also an important conservative measure. Such treatment has proven helpful in reducing leg pain and slowing the progression of venous disease. Improving your circulation and muscle tone can reduce the risk of developing varicose veins, but will not get rid of varicose veins once you already have them. Some insurance companies may insist on conservative measures prior to covering definitive varicose vein therapy. Ultrasound guided sclerotherapy is used for the treatment of deeper veins that cannot be seen or felt and for larger superficial veins. 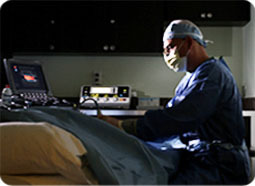 This is a technique in which the physician uses ultrasound to puncture the vein. Once a needle is inserted into the vein, a solution is injected causing the vein to close and shrink. This technique allows us to close off veins, which may not be suitable for other ablation techniques. 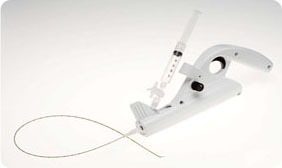 Also known as EVLA or EVLT, this is a minimally invasive, FDA-approved technique using ultrasound guidance. The vein responsible for the Venous Insufficiency – most often the Great or Small Saphenous Vein, is closed using heat energy. This can be done with a laser or with a radiofrequency (RFA) device in the office. We use the 1470mm wavelength endovenous laser, which minimizes post procedure pain and bruising compared with older lasers, and is comparable to RFA in terms of recovery. Spider Vein TreatmentThis is the latest technology. 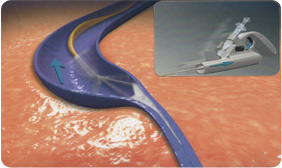 Laser technology utilizes thermal energy – heat – to destroy veins when performing EVLA. This requires that enough local anesthetic be placed around the vein (called tumescent anesthesia) to insulate the surrounding tissue from injury. That does add some time to the EVLA procedure and may add some additional mild discomfort. The Clarivein device instead uses a combination of mechanical and chemical destruction of the vein wall, rather than heat. The tip of the device employs a thin, flexible wire that rotates and scrapes the lining of the vein, while small amounts of a solution used to destroy the vein wall are infused. Results of several studies show success rates comparable to laser and RF ablation. Varicose Veins TreatmentBecause there is no risk of thermal injury of the adjacent tissues with the Clarivein device, and therefore no pain, tumescent anesthesia is not needed. This shortens the procedure time. We have also found patients treated with the Clarivein device have less post-procedure swelling, bruising and pain. The choice between Clarivein and laser is not necessarily straightforward, and would be based on a patient’s unique anatomical considerations. North Beach Vascular is the first and only facility in the area to have access to this state-of-the-art device. After the abnormal veins responsible for venous reflux have been ablated, sometimes there are still some varicose veins visible. These can be removed through tiny incisions in the skin using local anesthesia. This procedure takes 45 minutes to an hour. After the procedure a bandage is placed over the incision site(s) and your leg will be wrapped for 2 days. You should walk normally and wear compression stockings. Sclerotherapy is a technique used to treat spider veins (telangiectasia). Using a very fine needle, a medication is injected directly into the vein, causing the vein to shrink. Sclerotherapy is an art, requiring a lot of practice to master. Usually patients with spider veins will require a series of visits to treat all their veins, and some may require re-treatment. We perform Sclerotherapy in 20 minute sessions. Patients can return to work or other normal activities right after their appointment. We recommend wearing compression hose for a few days after sclerotherapy treatment to achieve the maximum benefit from the procedure. Improvement can take several weeks to become apparent, as it takes time for the veins to shrink and the residual blood and tissue to be resorbed by the body. Sclerotherapy has decades of proven results and safety, and has shown to be the most effective method of eliminating spider veins when done by a skilled and experienced professional. At North Beach Vascular, Dr. Gropper personally performs all the sclerotherapy, using the safest and most effective chemical sclerosants: polidocanol and Sodium Tetradecyl Sulfate. Topical laser treatments have had mixed results in the past, however in the last year or so there has been a significant step forward in effectiveness of laser treatment of spider veins with the new Cutera Excel V system. North Beach Vascular has recently purchased one of these lasers and we are very excited about the great results we are seeing. This laser has been specially designed to treat a large spectrum of abnormal veins from the larger green/blue reticular veins to the tiniest red or purple spider veins. It accomplishes this by being able to employ both 1064nm and 532nm wavelengths along with using an innovative cooling method that minimizes both patient discomfort and likelihood of skin burn. We have been seeing beautiful results on all veins-including ones that have been difficult to treat with sclerotherapy. For more information, go to www.excelV.com.